With train prices at an all-time high, it is little wonder many passengers are reassessing their transport options and travelling with Megabus - the low-cost coach service. With a model is based upon long distance coach journeys, sold at low prices (occasionally as low as £1 for less popular routes), Megabus serves over 120 destinations in the UK and Europe. Passengers willing to put up with sometimes gruelling journey times can make huge savings. Using YouGov Profiles data we can see which groups the service proves particularly popular with and in doing so it is clear why Megabus’ strategy is proving so effective. At first glance, its customers are what we would expect. Compared to the national average, Megabus customers are younger in age, with males aged 18-24 and 25-34 the most likely passenger age groups. They are also more likely to currently be a student. 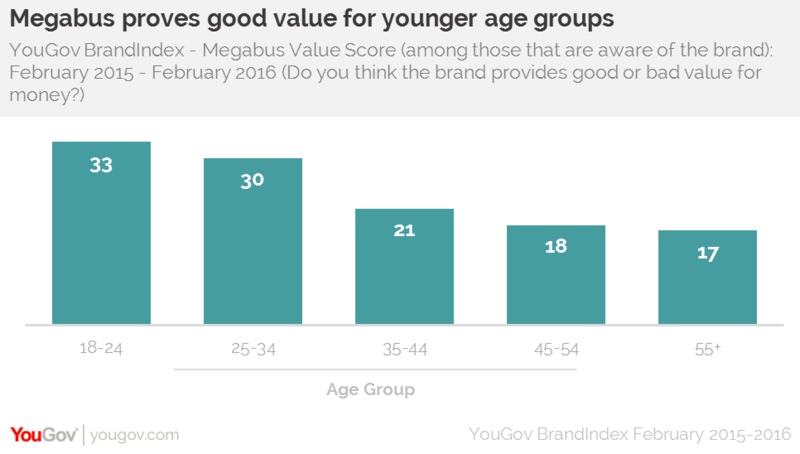 YouGov BrandIndex data indicates that perception of value decreases with age. Its customer base is not made up simply of students and young people as over half (52%) of current Megabus customers work full time. It may be that those in full time work choose Megabus over the train because certain groups in society no longer see rail travel as a viable long-distance transport option. It is notable that amost six in ten (59%) Megabus customers see railway nationalisation as a 'top issue'. This is supported by the fact that Megabus customers are more likely to be part of the C2DE social group. It is clear that Megabus is catering for this group very effectively by providing an alternative to train travel. For many, the brand may be viewed as a second choice or, indeed, a last resort. But the company's no-frills approach resonates with its customer base as well as those that minded to keep a close eye on their finances. Convincing consumers from the older age groups to become customers could be crucial in its expansion efforts.